The dangerous chemical plume beginning on Jan. 9 that spoiled the water supply for 300,000 people in West Virginia has prompted an array of responses in Washington, including rushing emergency supplies to the state, a field visit from specialized investigators and lawmakers calling for hearings on environmental regulations. 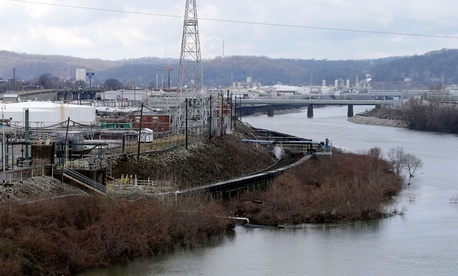 As officials told citizens Tuesday in the Charleston, West Va. area that the water was safe again, multiple calls were heard for probes into state and federal regulatory practices that failed to prevent the coal company Freedom Industries from accidentally releasing the chemical 4-methylcyclohexane methanol from a storage tank into the Elk River. President Obama declared the nine affected counties a disaster area on Jan. 10, and the Federal Emergency Management Agency dispatched water trucks and three million liters of bottled water from distribution centers near Charleston, as well as from Maryland and Philadelphia. Sen. Jay Rockefeller, D-W.Va., on Jan. 14 wrote to the heads of the Environmental Protection Agency and the Centers for Disease Control and Prevention requesting a comprehensive study into the long-term public health risks associated with crude 4-methylcyclohexane methanol. “I am making this request of two separate agencies with the goal that no stone will go unturned, and no jurisdictional confusion will leave any key question unanswered,” wrote Rockefeller, who urged Senate colleagues to boost fiscal 2014 funding for the U.S. Chemical Board. A 2013 report from the nonprofit Center for Public Integrity found that the Chemical Board is understaffed and underfunded to the point where its investigations remain open for too long. Sens. Joe Manchin, D-W.Va., and Barbara Boxer, D-Calif., chairwoman of the Environment and Public Works Committee, called for hearings, as did Rep. Henry A. Waxman, D-Calif., ranking member of the House Energy and Commerce Committee. Rick Hind, legislative director for Greenpeace and a member of the nonprofit Coalition to Prevent Chemical Disasters, said the spill “exposes a host of fatal safety gaps in our regulatory program” that is built around the Emergency Planning and Community Right-to-Know Act, Safe Drinking Water Act, Clean Water Act, Clean Air Act and the Toxic Substances Control Act.